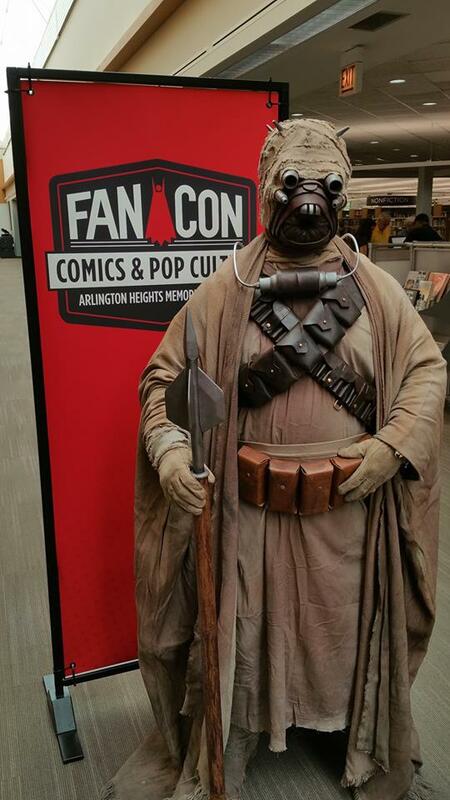 This past weekend was the inaugural FanCon at Arlington Heights Memorial Library. It's been something they've been toying around with for a few years, but this year they happened to have a superhero themed summer reading program, and they were able to pull things together to host a convention. It had a lot of things that you'd expect to see at a small library convention. 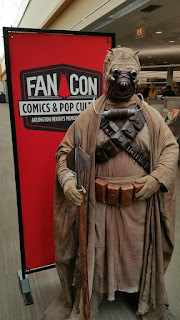 Several local tabling creators, a couple of nearby comic shops and bookstores selling their wares, the 501st Legion... There were activities around creating 8-bit art projects, the basics of cosplay, and so on. They even had a few panels, including one on crowdfunding (presented by creator Wesley Sun) and one on the overlap between comics and movies (presented by Gene Kannenberg and myself). Lots of custom signage, and they even printed up custom badges and lanyards! (Even though there was no admission fee!) It was a really impressive showing for a library, particularly for their first time out. I've seen the library con approach gaining traction in recent years; conventions in general have been on the rise, so that makes sense that others would take advantage of that popularity. But what's interesting is the radically different model being used. Most conventions are ultimately about making money. Vendors pay for their table space, fans pay an admission fee, not to mention whatever cut they make on concessions, parking, whatever. They want everybody to have a good time, of course, but they're not putting on those shows for free. Well, not totally free. I'm sure there's a nominal table fee, but that would basically just be covering whatever printing and advertising costs they might have. But much like Bob Cassinelli's show at Gail Borden Library that I talked about last year, the idea is very much about getting people -- particularly kids and teens -- more interested in reading. And while "regardless of cost" certainly wouldn't be appended to that, they certainly dropped a decent chunk of change pulling everything together. Not surprisingly, you do tend to see these types of events in better neighborhood libraries. That is, libraries in more affluent neighborhoods with reasonably strong tax base funding their materials. They can afford more events like this compare to their lower income counterparts. Which is a shame because they can have some really good material there and seem to be having a fair amount of luck getting kids the door. Keep your eye on what's happening at nearby libraries. You might find you're living not far from one, and will have the opportunity to score some good deals and meet some talented people.